KATHAKBOX by Sonia Sabri Company. Kathakbox is an innovative new stage production from one of the UK’s most exciting and dynamic dance companies. Sonia Sabri Company bring together the Indian classical dance form, Kathak and the universal culture of Hip Hop to celebrate the unique energy of modern Britain’s diverse urban spaces. Kathakbox creates conversations between the grace and vigour of Kathak and the complex, rhythms and rhymes of Hip Hop culture. While these art forms are often thought of within separate ‘boxes’ for different audiences and cultures, what lies ‘outside the box’? Kathakbox questions the idea of just ‘ticking boxes’ about our own and others’ identity, exploring outside and between the ‘boxes’ we use to categorise ourselves. Drawing on urban trends and global roots, a company of dancers and musicians find out, breaking into a new creative arena, never experienced before, a true collaboration between street, contemporary and Indian dance, beatboxing, spoken word and tabla vox. unspoken languages: rhythm, movement, poetry and rap in English, Hindi, Punjabi and Urdu. Harnessing the spontaneous nature of both Kathak and hip hop, the artists challenge each other’s space and our expectations with speed, power, grace, rhyme and rhythm. Kathakbox encourages us to ‘think outside the box’ and reflects the diverse, intersecting rhythms of the human experience. The much anticipated 2011 tour of Kathakbox comes back to its inception at The Place as part of Spring Loaded 2009. The artistic journey began at Choreodrome, The Place’s choreographic development programme, with mentoring support from esteemed choreographer Richard Alston. Sonia Sabri Company also received a special invitation to perform an early extract of Kathakbox at The Place’s 40th anniversary celebrations. 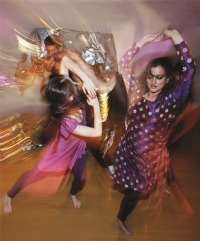 Since premiering in February 2011, Kathakbox has been performed to rapturous audiences in the UK and internationally, including a successful residency in the United Arab Emirates which was the largest audience development programme ever organised by the British Council and Abu Dhabi Authority for Culture and Heritage. The UK tour will allow audiences to experience the power and excitement of Kathakbox on their doorstep as it performs at over 20 venues across the nation. Featuring Sonia Sabri performing alongside three dancers including b-boy Nathan Geering, internationally recognised tabla maestro Sarvar Sabri, acclaimed spoken word artist & vocalist Marcina Arnold and beatboxer Shan Bansil, Kathakbox is one of the must-see new creative highlights of 2011.